This is the third blog post in the series of my 15 most effective sales tactics. How many times have you been lucky in sales – first in with a hot prospect that was in the Window of Dissatisfaction described in my first blog post? These hot prospects often turn into your best customers – core, loyal, profitable customers who will gladly give us referrals – IF WE ASK for them. If you want to have more customers just like those described above then STOP analyzing the sales you lose and start analyzing the sales you win! For many years I subscribed to what my sales manager taught me – “If you lose the business don’t lose the lesson”. So for many years, I analyzed the sales I lost ‘hoping’ to figure out how I could win. One of the things Guy Kawasaki is famous for saying is “Hope is not a strategy”. One summer I stopped analyzing my losses and I analyzed my six, seven and eight figure wins and an amazing thing happened – I learned the secret to winning more sales with the hottest prospects that turned into my best customers. 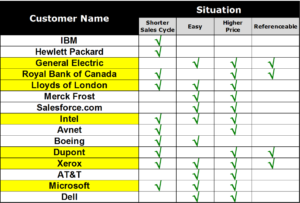 Here is my take on how to best conduct a Won Sales Analysis. Use this form to a list of your most recent ‘net new’ customers – not ones you’ve sold to before – and then go down that list putting a check mark next to the name where the sale happened faster than normal. Now repeat the process for those where it was relatively easy to reach the true decision maker, again for those who did not spend much time trying to grind you on price, and once more for those who gave you a testimonial or were willing to be a reference. Now you want to pick up the phone or arrange a meeting and ask the following questions of those who have three or more check marks next to their name. DON’T try and skimp by sending a link to survey or having someone else do this for you. Part of the power of a Won Sales Analysis is that when done right it will turn on the Selective Perception that I’ve written about before and all of sudden you will start noticing hot prospects who recently experienced a Trigger Event and are in the Window of Dissatisfaction. 1) What change or changes led up to this purchase? When you ask this question you are often told about the second of three key Trigger Events – Afford: Prospects can afford the time to look at what you offer and /or the money to buy it. This is good but what you really want to understand is what was the first Trigger Event – the one that made them want to change. I’ve learned that to do this you need to ask the second question. 2) When did this event happen? 3) What made you choose us? Notice that I did not ask “Why did you choose us?”. I have been told that “Why” questions make people defensive, so avoid them if you can. When you ask this question what you want to listen for are the verbs they use to describe the outcome they got by becoming your customer, not the nouns and adjectives that describe the specific product. 4) How can we make it easier to become a customer? Kurt Lewin’s force field analysis research shows that instead of creating additional reasons for people to change, you are better of removing the hurdles that resist the change. So by finding out what aspects of your sales process or their buying process makes it harder for hot prospects to buy, you can address these issues and streamline the experience. I recently saw an IDC report that said “IT buyers are desperate to reduce the amount of time it takes to make IT purchase decisions, and more than a third of them are willing to change vendors to do it. 5) On a scale of 1-10 with 10 being the highest, how happy are you with your purchase? You want to make sure that the person is in the buying mode of Status Quo – Happy with what they now have and see no reason to change. Once it’s a ten then you know it’s time to ask for a referral. Not just any referral but one to a decision maker – vp or higher – who recently experienced a Trigger Event that makes them unhappy with their current Status Quo. 6) Who do you know that recently experienced the changes (Triggers) that you just described? I’m a big believer that referrals drive business. In order to get the better referrals all your have to do is ask your best customers for referrals to the hottest prospects. You don’t want a referral to someone who is in the Status Quo or Searching for Alternative buying stages defined in my first blog post in this series. You want a referral to someone where you will be first in with a hot prospect in the Window of Dissatisfaction. So this question is phrased very precisely to make that happened. 7) What did you formerly use for this purpose? Ask your new customer to tell you what your product just replaced. Then, if you start to see a trend, report it to colleagues in marketing or management. There could be an opportunity to create customized content for a specific buying path. So there you have it, a simple way to learn of, start seeing, and being referred to those who recently experienced, the specific Trigger Events that create hottest prospects, who are most likely to turn into your best customers, for what you sell. In my next blog post I’ll share what the #1 revenue generating Trigger Event is and how one single Trigger Event can quickly turn into four hot prospects.